As participation drops, parents of Deering and Portland high school players will toss around the idea of unifying their teams Thursday night. Some Deering and Portland high school parents believe the time has come for the schools to field a combined football team, a move that would end a rivalry that stretches back more than a century and includes a storied Thanksgiving Day matchup. Citing concerns over declining participation numbers – particularly at the youth level – the parents will get to make their case at a community meeting Thursday evening. Tackle football participation in grades 2-8 in the Portland Youth Football League dropped from 190 in 2015 to 97 in 2018. Only 14 eighth-graders played last fall. Thursday’s meeting, titled “Football in the City of Portland,” will be held from 6-7:30 p.m. in Room 141 of the Portland Arts & Technology High School. Principals and athletic directors from Deering and Portland are expected to attend, Deering AD Melanie Craig said. Athletic directors emphasized that the meeting is intended to address all levels of football in the city. Across the state, schools are struggling with how to maintain their football programs. The number of high school football players in Maine declined by 16.9 percent between 2008 and 2017. On Tuesday, a Maine Principals’ Association panel proposed two divisions of eight-man football – a version of the sport never played at the varsity level before in Maine. Schools must inform the MPA before Jan. 25 whether they are going to play eight- or 11-man football next fall. Deering and Portland have not expressed an interest in eight-man football. Portland High had rosters ranging from 45 to 51 players from 2015-2017. Last fall, the Bulldogs had 37 players. After graduation, they could have as few as 24 returning players next fall. Deering’s roster has had greater fluctuation: 61 in 2015, 37 and 38 players the next two seasons, and 49 last fall in Rob Susi’s first season as head coach. The Rams could return as many as 38 players in 2019. Fortin said her major concern is that small rosters increase the risk of injury because young, inexperienced players will be forced to compete at the varsity level. Combining the programs would end the traditional Thanksgiving Day game, which has drawn smaller and smaller crowds in recent years. 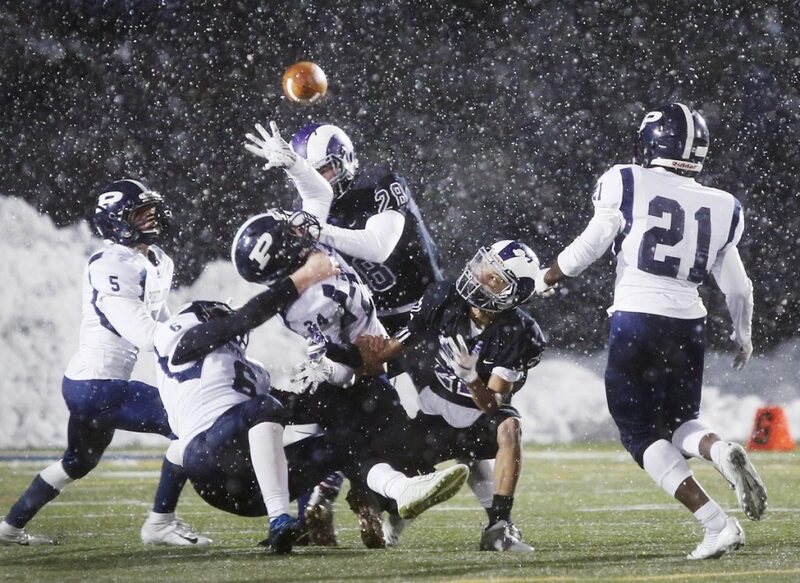 Portland beat Deering, 45-0, on Nov. 21 in the game’s 107th edition. Deering and Portland already field co-operative teams in boys’ and girls’ ice hockey. Rob O’Leary, the athletic director at Portland High, said he welcomes Thursday’s meeting but believes now is not the time to form a co-operative football team.